This record was made around 2002, although it only saw the light of day in 2007. The fact that our label is so small and independent makes it so that I have to write music that predicts the moment of it's release. That's why I think most of the tracks on here are actually ahead of their time. 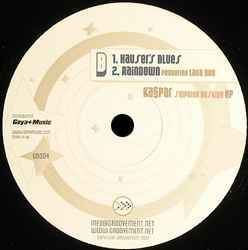 Raindown is a soulfull reggae house tune, deep and emotional, that has little to no relation to anything before or after it, while Still Trying's broken house beats are reminiscent of what people like Martyn or Intalex would do years after. Reach Inside is a completely original G Funk soundtrack with no samples, but with the full deep west side feel to it, but also has a tech-hop edge that relates to what Mark Pritchard would do as Harmonic 313. Finally Hauser's Blues is a club hit that was never discovered, fusing perfectly the production of experimental house music (the way people like Villalobos and so many others do it) with the utter funk of a greart melody and hook, something that has never happened that way, before or since this record's release. I think this piece speaks for itself. As the author, I'm quite fond of this record, and so I'm not the best person to judge it, so please allow me to be a bit biased... but I think it's fair to say that although it sould out quickly, it's 500 copies make it a nice little piece of rare portuguese music worth the listen to say the least.